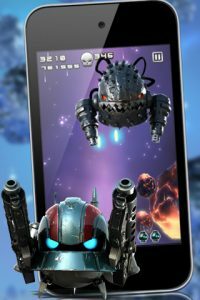 Titles like Dodonpachi Resurrection and Espgaluda II have proven that the iPhone is a more than capable machine when it comes to the vertical space shoot-em-up (aka “shmup”). And while Super Blast 2 from Phantoom Entertainment doesn’t quite reach the lofty heights of those amazing titles, it succeeds in delivering a more simple experience, perfect for those who don’t need complex scoring rules or sheets of bullets raining down upon them. In Super Blast 2, you control a small, droid-like ship as it blasts its way through wave upon wave of enemy fighters, space mines, and large boss ships. 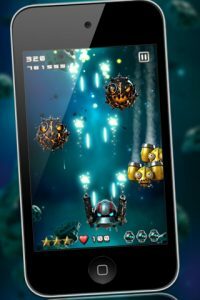 The game is controlled via tilt, though you can only move your ship left and right along the bottom of the screen, a la Galaga. Your ship also fires automatically, making this an almost completely hands-free game. You are able to toss out bombs at enemies by touching anywhere on the screen. 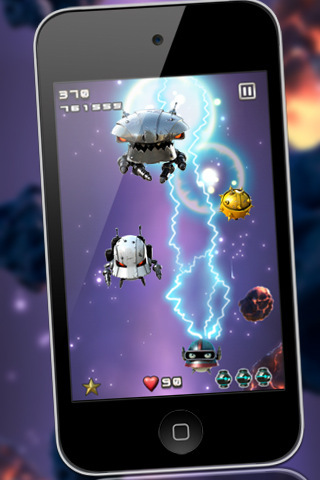 There are a number of power-ups available in Super Blast 2, from a spread-shot, to a pair of ninja stars, an electric beam, and a large bomb you can lob at your enemies. Chain enough enemy kills together and you’ll gain a point bonus. Speaking of points, Super Blast 2 is Game Center and Open Feint compatible, meaning you can see how your score stacks up against your friends and the world. From there, the game is actually quite simple. Dodge enemies while taking out as many as you can, collect power-ups and health bonuses, reach an end-stage boss battle, and move on to the next level. Your ship has a health meter, meaning you can take a certain amount of damage. However, colliding with certain enemies will invoke an instant game over. Shallow gameplay aside, the artwork in Super Blast 2 is wonderful. 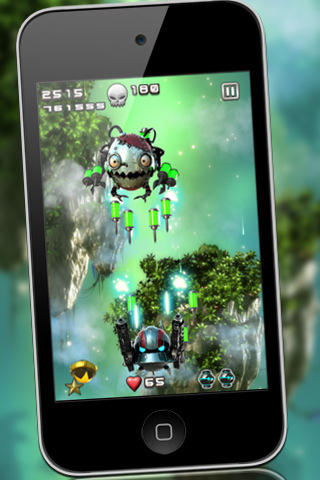 Bright and colorful backgrounds compliment the cartoonish and metallic enemies. Sound effects and music nicely done as well, with electronic techno beats, electric zaps, and big explosions providing effective ambiance. Bottom Line: While Super Blast 2 isn’t the deepest shooter on iPhone, the score chase and the simple gameplay is enough to make it worth the purchase. 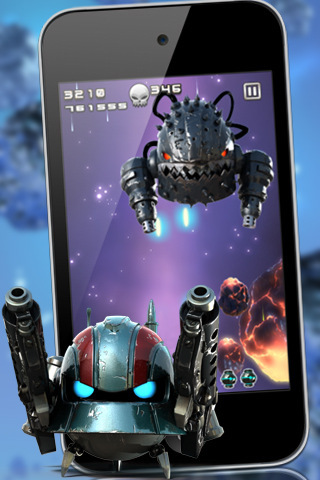 Super Blast 2 is compatible with iPhone, iPod touch, and iPad. Requires iOS 4.1 or later.